Home Movies Daniel Padilla is Liza Soberano's leading man in 'Darna'? Daniel Padilla is Liza Soberano's leading man in 'Darna'? 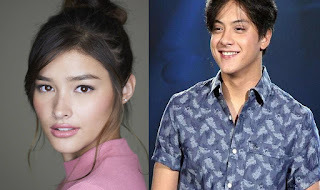 After the announcement that Kapamilya actress Liza Soberano will be portraying the iconic Filipino superheroine 'Darna', fans are already expecting that her on-screen partner, Enrique Gil, will be playing as her love interest in the highly-anticipated movie. However, there's a rumor that Daniel Padilla might be the one who's going to play as her leading man. According to Bandera report, someone who's very close to the actor is pushing to pair up the two for the movie. The suggestion, according to the report, is a way to develop Daniel's solo career as an actor and also a way to avoid the 'sawa factor' on the KathNiel loveteam. Pairing Daniel with a new partner would also help Kathryn's own career to level up. 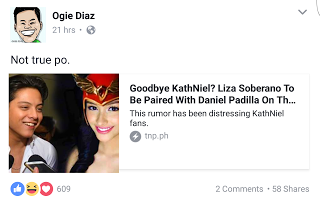 Ogie Diaz, the talent manager of Liza, reacted on the report. In his recent post on facebook, he denied that that the actor will be paired up with Liza in the movie.